These polishes are from the Dance Legend Round Space collection, which you can find on their website and in various webshops. The collection consists of 6 jellies with lots of holo glitter in various shapes and sizes. I used 3 coats for each, but I'd try to apply even thinner coats next time, or layer them on a fully covering base, to get a slightly thinner endresult. I did need to fish a little for the big, round glitters, but I didn't expect anything else really! 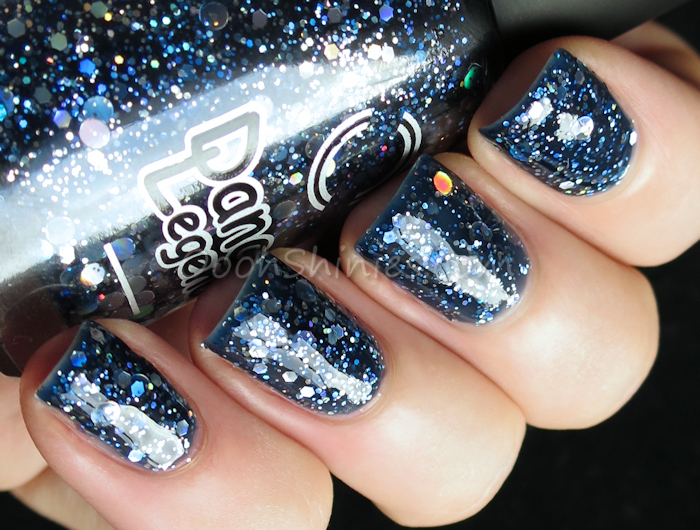 Supergalaxy has a dark, ink blue jelly base, packed with silver holographic glitter. I wanted to see how these 2 polishes looked matte as well, and I think they look great either way! It doesn't show as well here but oh, those bold holo sparkles, yum! I think it's a great name for this polish, and I'm curious to see how it'll look layered on a black, or perhaps on a dark purple?